I have been asked by several people to repost this on it's own thread for easy reference. manufactures a variety of breakthrough chemicals and Lubricant Catalysts designed for Aerospace, Military, Commercial and Industrial applications. ACES’s staff has more than 42 years of accumulated expertise in the field of developing and manufacturing a variety of true multi-functional and high quality fuel catalysts, and in the development of customized catalysts for specialty fuels. ACES manufactures multi-benefit catalysts for bulk blending, military and fleet applications, racing cars, and aftermarket products. As a result, our multi-functional products contain the world’s foremost advanced technologies on maximizing the unique features of the contents of these products. The initial development of the multi-functional fuel catalyst was for a special military application. The base initial formulation was developed and designed to provide three main features: improve the fuel’s ignition/combustion properties, fuel system and combustion chamber detergency, and top cylinder lubricity. Spending years of emphasis on understanding these three initial multi-functional features has enabled us to successfully develop a number of related specialty products for all types of engines and applications. Each product contains the same base formulation, however, the chemical composition ratios of each product vary, including the addition of other compounds to improve and/or enhance the performance of the base fuel used, as well as, to fit each specific engine or application. Today, ACES manufactures products for gasoline blending (ACES IV), products for bulk/fleet diesel and fuel oil blending (ACES II), specialty products for diesel and fuel oil contamination treatments (ACES II-FP), specialty military diesel fuel treatment and preservation (ACES II-FP), racing fuel catalysts (ACES IV-P), for both commercial and aftermarket products. Our products have a wide variety of uses in all fuel related industries. Each product is designed to provide the most value to customers whose needs have driven ACES to focus on technical and service support programs and continued research. A continued exploration of new product development, as well as modifications and improvements to current products, help to fit any changes in the industry. Also modifications to engine design, or fuel manufacturing processes, has been essential to the success of ACES and its customer satisfaction. Working closely with customers allows ACES to provide service and technical support on all our products. This interaction helps us to monitor very closely the response to formula changes, to meet the customer’s needs. In many situations, ACES has developed prevention and maintenance programs for customer specific applications which resulted in substantial long term savings and reduction in maintenance cost and downtime. ACES is privately held, owning it’s own laboratories and manufacturing facilities. Our marketing, our bottling and retail package distribution is located in Macedonia and Lodi Ohio. The current tankage capacity is at about 80,000 gallons which converts to a production capability of about 10.4 million gallons a year for bulk distribution. (5 days week at 200,000). 2 alternative facilities are available online within 48 hours to produce 3 times current capacity. The bulk production facility is modernized, which is essential in assuring manufacturing quality control. The manufacturing and bottling is ISO 9001:2000 and was issued December 11, 2003. Each raw material is inspected and monitored, as well as each step of the manufacturing and filling process. Significant improvements have been made to the plant which give our operators and maintenance team the technology to ensure safe, and reliable plant operations and production of consistent products. The plant has an easy and accessible loading rack for tanker loading, and drum filling. The bottling facility has fully automated and semi-automated filling equipment. Our plant is located in the United States, and it allows us to deliver American Made products to customers within a relatively short time. Likewise, we are able to deliver to most international ports within two days and within 3-4 days to the different U.S. coasts whether eastern or western. In addition to providing technical support for our products, we also provide specialty services to our customers. This includes assisting in designing and implementing automated catalyst injection systems; both stationary fuel terminal type, as well as mobile units for trucks, bulldozers, construction vehicles which all feature self feed injection designed and built by ACES. Also fuel preservation programs; bacterial contamination handling; which includes analysis of contamination level, treatment, prevention programs, and future fuel preservation programs and treatments. In many situations, our field sales/technical staff will travel to the customer’s location and supervise the installation and/or treatment process. On site support, has proven, in many cases, not only to save the customer money, but also to dramatically reduce operation down-time. Better understanding of the customer’s needs, enables us to further research and develop newer and improved products, as well as developing prevention programs for future handling and use. The Bulk & Fleet Division manufactures two groups of products: ACES II series for diesel and fuel oil applications, and the ACES IV series for gasoline applications . The products are manufactured in a concentrated form, making it very economical and easy to blend with large volumes of fuel. The Bulk products are packaged in one gallon containers, 55 gallon drums and ISO tankers (6000 gallons). The Aftermarket Division manufactures different catalysts in 32 oz containers for retail applications as well as gallon form. In addition to the “standard” bulk products, ACES ‘s Research and Development (R&D”) Division designs and custom blends formulas to meet the bulk users’ specific requirements. One example is a special formula for Mainland China for Beijing, and Tiangin. Also, ACES ‘s R&D Division offers bulk customers additional services including field and laboratory testing, and custom formulary modifications. The following are types of specific features and benefits that can be achieved with the use of ACES fuel products. IGNITION IMPROVER - The primary benefit is the improved firing and burn rate, which leads to improved fuel efficiency, increased engine power, and improved cold starts. OXYGEN AGITATOR - A catalyst that improves and releases additional oxygen and nitrogen during combustion. INJECTOR & CARBURETOR CLEANER - A compound, which works by solvent action to hold deposits in solution so they do not plate out. This will result in a cleaner carburetor plate or fuel injector tips & ports resulting in an improved spray pattern. DEPOSIT CONTROL - This compound helps dissolve deposits & solids, promotes molecular balance, reduces knock & after-run caused by deposits found in the base fuel before treatment. TOP CYLINDER LUBRICANT - This benefit is a result of the burning of the formulation during combustion. The by-product of this reaction is a form of synthetic lubricant that cushions the valves & valve seats, cylinder walls and rings. This lubricant helps reduce friction, overheating, and prevents carbon buildup in the combustion chamber area. CORROSION INHIBITOR - This compound forms a protective film which prevents water from contacting the metal or other alloy surfaces. It works extremely well on aluminum, copper, bronze and magnesium. METAL DEACTIVATOR - Prevents copper and other alloys from catalyzing the oxidation process and helps to eliminate the formation of gum deposits. The De-Activator surrounds the alloys (especially copper) and renders them inactive. ANTI-OXIDANT - This feature stabilizes the base fuel, especially lower grade fuel or fuel that is processed with higher Olefinic materials from thermal or cat cracking processes. DISPERSANT - Will emulsify and disperse particles, while keeping them suspended with the base fuel. GENERAL DETERGENTS - Immediately reacts with the base fuel to prevent varnish and lacquer build-up in the fuel system, valves and the entire combustion chamber area. ANTI-ICING - Improves pour point (fuel gelling) and prevents ice formation in the throttle plate and fuel lines. COLD FLOW IMPROVER - Retards wax and crystal formation so they do not restrict fuel flow. GUM AND VARNISH REMOVER- Eliminates future contamination produced by bottom sediments. The initial base formulation of the ACES multi-functional catalyst is unique. Some proprietary processed catalysts enabled the blending of numerous chemicals with different properties into one blend without separation or adverse reactions. These catalysts act as emulsifiers” of the various chemicals into midrange viscosity (specific gravity ranging from 0.850 to 0.950). This feature allows the addition of any type of catalyst required into the multi-functional formulation. Upon contact with the base fuel, several reactions take place: The deposit control compounds, coupled with the antioxidants help in stabilizing the base fuel and in dissolving deposits and solids, and promote molecular balancing. The dispersants encapsulate particles and keep them suspended in the base fuel. The corrosion and rust inhibitors prevent water from contacting metal or other alloys by forming a protective film-like coat over the alloys. This is effective not only for the fuel tank, but the entire fuel system and top cylinder components. Anti-icing and cold flow improvers prevent ice formation, and retard wax and crystal formation. Also gum and varnish remober that stops bottom tank problems while acting as a fuel preservative - extending the fuel’s storage life. The detergents shave off” carbon and varnish deposits in layers. Once the build-up is removed and the alloy surface is exposed, it is covered with a light-film like coating. The film coats the entire fuel system, including the fuel tanks, lines, pumps, carburetors, injectors, etc. The ignition improver enhances the burn rate of the fuel and the flame propagation. Once ignition begins, and upon heat and compression build-ups, the oxygen agitator catalyst reacts, resulting in release of additional oxygen (and nitrogen) that normally are not released in combustion. This in essence increases the air/fuel ratio during combustion, resulting in more efficient burning of the fuel, while increasing compression (i.e., more horsepower per cycle, less unburned hydrocarbons released through the exhaust, etc.). A residue is formed from the burning of the catalyst forming a synthetic lubricant, cushioning the entire top cylinder area (i.e., valves, valve seats, cylinder walls, rings, pistons, etc.). The base formulation is used in all products, but each formula is modified for a particular application and the chemicals’ ratios are changed to meet the specific engine’s or burner’s operating conditions. ACES has formulated products for various engines and applications like gasoline (ACES IV), two stroke (ACES IV-2S), diesel(ACES II), high performance and racing engines (ACES IV-P), aviation fuels, heavy fuel oils, etc. Effect on friction reduction and top cylinder lubrication. The tests were conducted on a 355cid small block Chevrolet engine with a compression ratio of 14.7:1. special short-period high lift cam, modified cylinders and high pressure exhaust. The ignition system allowed ½° a changes, and an electronic controlled 4 barrel carburetor that allowed 1/2 increments on jet size changes. All tests were conducted at 3,000 RPM, with controlled water and oil temperatures. There were two reference base fuels and one base fuel treated with ACES IV catalyst. (3)	Union 76, 91-octane unleaded gasoline treated with ACES IV. Initially the two reference fuels were tested in various conditions to determine the horsepower output of each fuel. Tests were conducted with a fixed spark and mixture, but used various spark timing positions and jet sizes. This was done to establish the maximum power that each reference fuel could deliver. The 105-octane racing-fuel delivers its optimum performance of 224.0 horsepower. The 91-octane (R+M/2) premium unleaded reference gasoline delivers its optimum performance of 190.0 horsepower. The results of these two reference fuels demonstrated (and reconfirmed previous tests) that the higher octane racing gasoline (105 R+M/2) produced the highest horsepower that the test engine’s configurations can deliver. 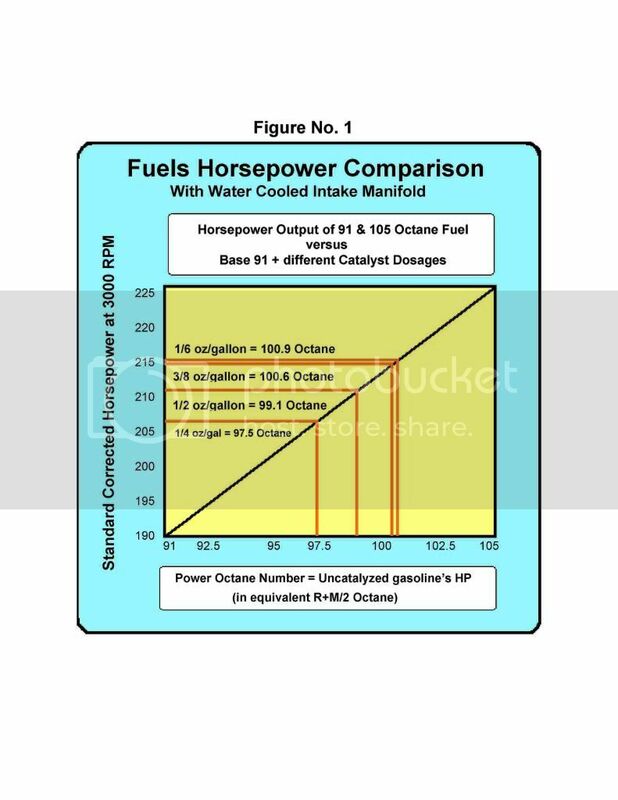 The optimum horsepower output of the 91 (R+M/2) octane gasoline provided a good reference for octane versus horsepower outputs (i.e., a viable octane/HP curve was established). The 91 octane gasoline was then treated with ACES IV multi-functional gasoline catalyst at various dosages. This helped us in developing the catalyst’s performance curve at each different dosage. It also demonstrated the catalyst’s impressive power increase, whereby the optimum horsepower output was 215.5 HP. The differences between this and the power output of the untreated base fuel (which produced 190. HP), represents an increase of 25.5 HP, which is equal to 13.5%. The addition of the catalyst to the 91 octane fuel resulted in near optimum horsepower output when using the catalyst in a relatively low dosage of 1 oz per 6 gallons (770:1). Figure No. 1 was developed by establishing a straight line correlation between the HP output of the 91 octane reference fuel at the bottom, the HP output of the 105 octane reference fuel at the top, and the octane number of the fuels. 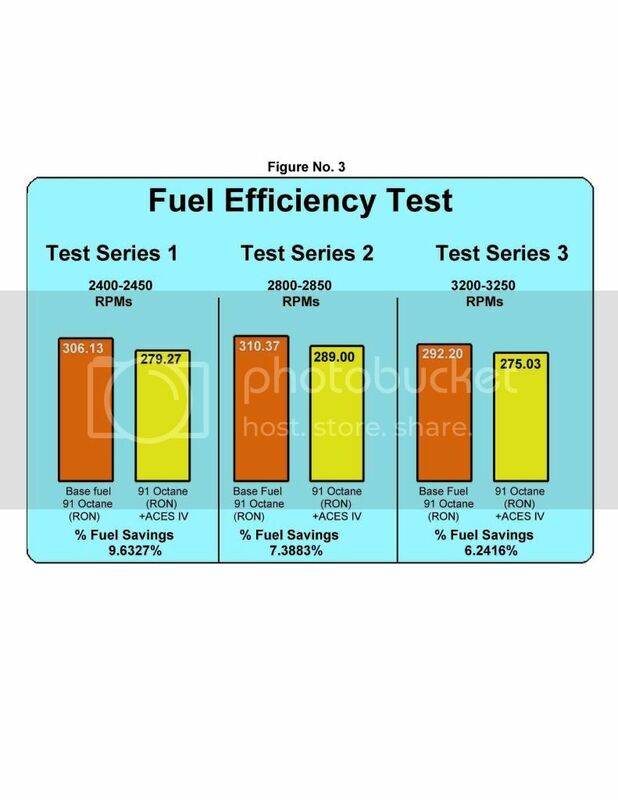 This shows a relationship between the horsepower output and the fuel’s octane number. The result of each dosage of the additized fuels is then compared to the octane value curve. This concept is called “Power Octane Number” or PON. Even though this method is not 100% scientifically proven, previous tests revealed a very close relationship between octane and horsepower when the fuels tested were of equal quality. For example, a blend of 70% of 105 octane and 30% of the 91 octane, resulted in 100.8 octane gasoline which produced 215. HP. The horsepower produced with the catalyzed 91 octane was 215.5. Based on this established octane point, the “PON” of this catalyzed fuel is 100.9. These results are very close to the actual octane/HP test results. 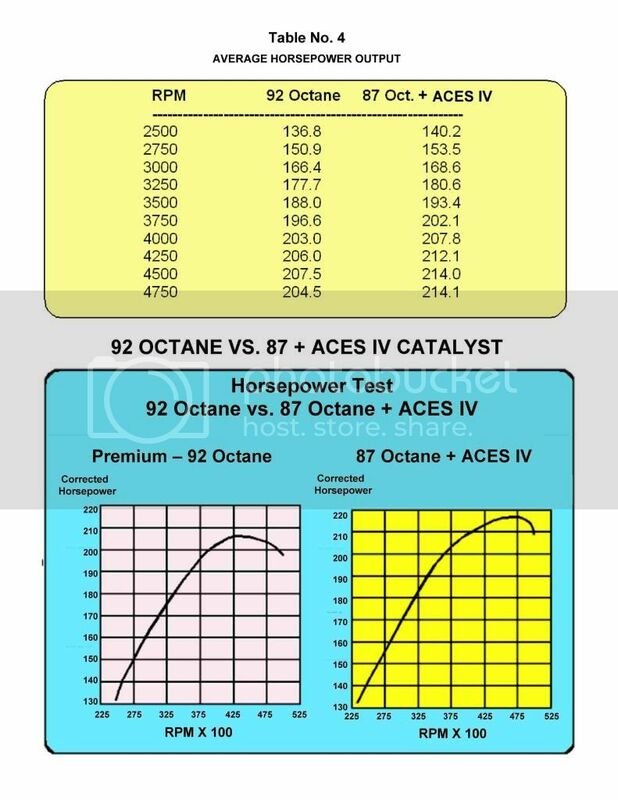 According to the above-mentioned results, it would be safe to assume that the octane versus horsepower curve established represents a fairly accurate Power Octane Number (PON)” rating (within 0.1 - 0.3 octane ranges). (C)	Exhaust valve stems had zero scuffing and no measurable wear, engines usually show a little scuffing on at least 2 or 3 valves. (D)	Bores - Due to the amount of detonation this engine sees, it has extreme bore wear, nominal bore life for test purposes is 60 hours. At the end of these tests, the bores appeared to be in a much better condition than were expected. A simple wiping of the bores with the finger indicated a very fine film of lubricant. Again, far more so than with previous un-catalyzed tests. (E)	Samples of the residual top cylinder lubricant were sent to an oil laboratory. It was proven to have properties similar to those of known 100% synthetic lubricants. Figure No. 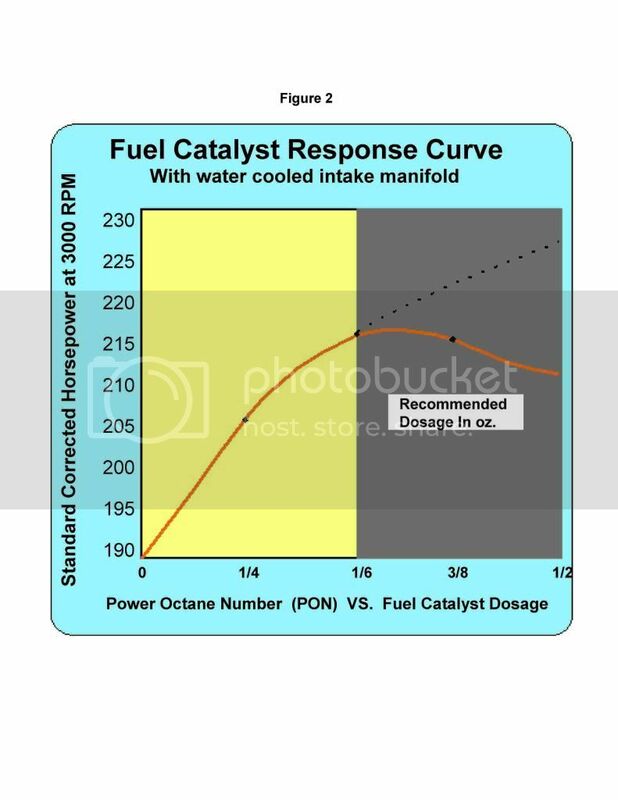 2: demonstrates the Catalyst’s dosage curve i.e., the Catalyst’s effect on horsepower at various dosages. An examination of the various dynamometer test results with inspection and analysis of the engine’s top cylinder components, and the lubrication analysis, leads one to believe that the horsepower increase using the ACES IV multi-functional catalyst is most likely due to the ignition improver, and the reduction in friction from the catalyst’s synthetic residual after combustion. Numerous fuel efficiency tests were conducted on ACES IV gasoline catalysts. Traditionally, the larger the engine displacement, and the older the engine, the more effective the catalyst is on improving fuel efficiency. In new (freshly reconditioned) engines, and in smaller size engines, the fuel efficiency is not as significant as that of the older and larger ones. However, fuel savings were recorded with as little as 6% (in new and very small engines) to as high as 35% (in large V8 engines with more than 150,000 miles). For these reasons, and for examining the catalyst’s minimal effect on fuel efficiency, the following test is presented. 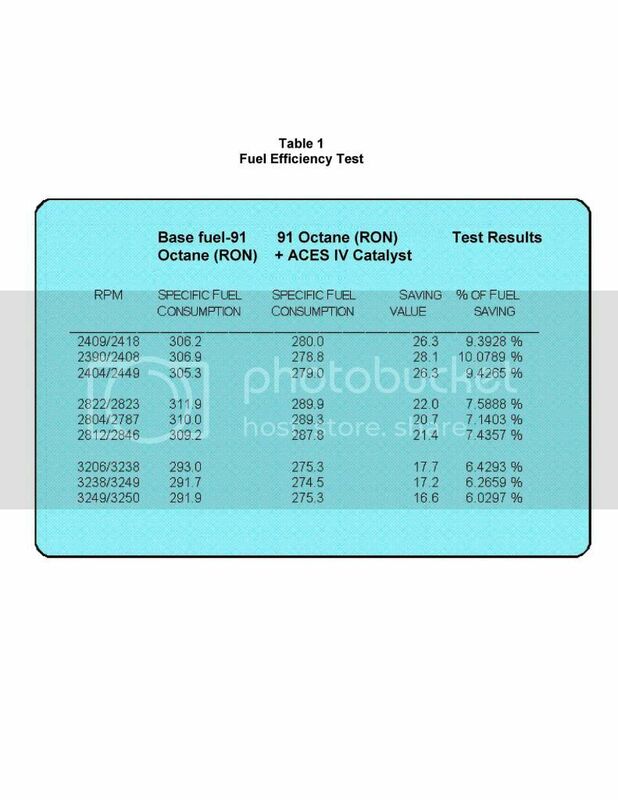 This next test was to determine the ACES IV catalyst’s fuel consumption effect on an engine in which they previously tested and found to be reliable and economical. The engine chosen was a 4-cylinder Subaru, with a compression ratio of 9.1:1, and piston displacement of 1267 cm3. The engine was reconditioned, and was tuned and calibrated to produce the best fuel efficiency. The fuel chosen for the test was regular grade gasoline with an octane rating of 91 (R+M/2). (1) at 2400 RPM range; (2) At 2800 RPM range, and (3) At 3200 RPM range. The same conditions were repeated with the second series of tests conducted, with the same reference gasoline but with the addition of the ACES IV catalyst at a ratio of 1:770 (vol/vol.). This test was conducted by a Dyno & Engine Service on a 305-Chevrolet engine with a 9:1 compression ratio (47° total advance @ 2500 RPM). The purpose of the test was to determine the fuel consumption in Pounds per Horsepower, per Hour, for the purpose of comparison. In this test, three (3) different types of gasolines were tested. 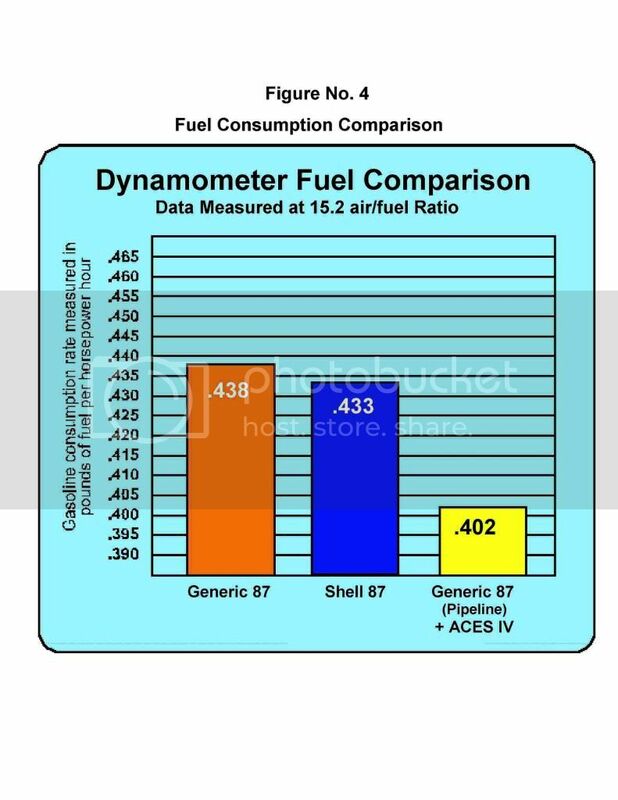 One of these fuels was named Shell, one was a generic fuel, and the third fuel (called Fleet Fuel”) was another off brand” terminal gasoline (as supplied by the pipeline without additives) and then treated with the ACES IV catalyst. Operating conditions were consistent in all three fuel tests. Each fuel was tested at two different air/fuel ratios: (1) 14.5:1 and (2) 15.2:1. The Fleet Fuel gasoline used less fuel, with the catalyst, than the other two brands at both air/fuel ratios. See Figure No. 4. In addition to the system cleanliness found in the power tests mentioned above (No. 1), the catalyst was tested for its detergency effect at the lowest dosage possible in a multi-port fuel injection system. The test was conducted on a chassis dynamometer utilizing a 1987 Chevrolet Celebrity equipped with a 2.8 liter multi-port fuel injection system (Rochester type injectors). The CRC test procedure was followed whereby 241 hot soak cycles were run (15 minutes of engine run, and 45 minute off [soak]). High olefin fuel was used for the first portion of the test. 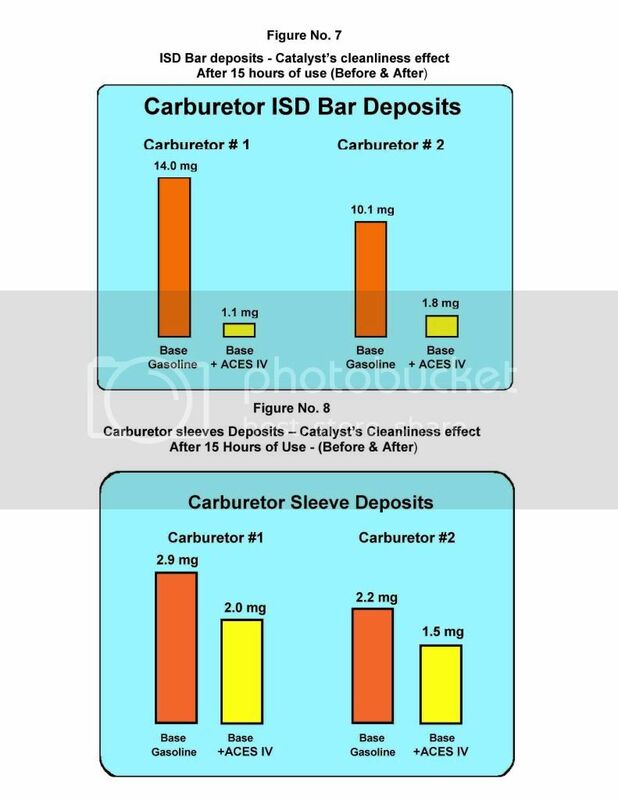 The purpose of using high olefin gasoline and the hot soak cycle is that such conditions would create carbon and varnish build-up on the injector tips at an accelerated rate. Engine HP, oil, coolant, fuel, intake, and exhaust temperature were measured and controlled. Similarly, HC and CO emissions were recorded. The multi-port fuel injectors were taken out of the engine at the beginning of the test, at the end of the 241 hot soak cycles, and at the completion of the catalyst treated fuel test. In each one of these three phases, the injectors were inspected and measured for their fuel delivery capability (grams per minute), the injector’s spray pattern and angle, and photos were taken of several situations. (i.e., the spray pattern, the angle, injector tip condition on all injectors, engine heads, combustion chamber deposits, etc.). At the end of the hot soak cycles test, the injectors were clogged and lost a substantial level of fuel flow (from 10-25%). Most injectors’ spray pattern decreased (spitting” versus smooth mist), the spray angle was reduced (from about 21 ° to about 17°), and the engine’s overall drivability condition faltered. The engine wouldn’t idle, and would stumble during fast acceleration. One injector (at Cylinder No. 4), was damaged so severely that it ceased to operate. After all findings were recorded, the vehicle was fueled with high olefin (40%) gasoline (provided by Lagoven, Venezuela), and was treated with the ACES IV catalyst at a ratio of 1:770. The vehicle was then driven for 1295 kilometers on the highway. At the completion of the highway cycle, the injectors were taken out, and the aforementioned conditions were measured and recorded. 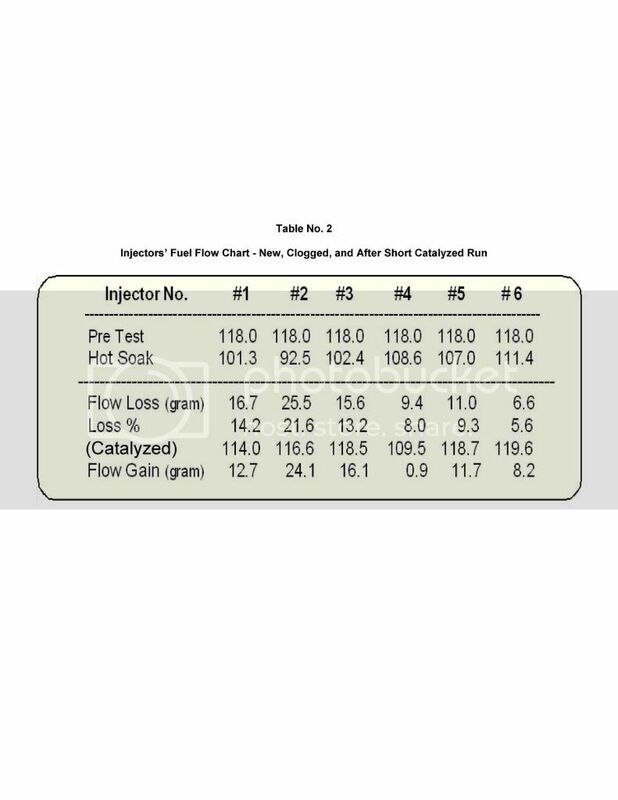 In summary, the catalyzed fuel in the highway cycle cleaned the clogged injectors and brought the injectors’ fuel flow to factory setting conditions (grams per minute, spray pattern, angle, etc.). The engine was not only restored to normal operation, but improvements were noticed in horsepower, acceleration response, ease of starting, and emission reduction. The fuel flow test, showed the ACES IV catalyst’s ability to clean clogged injectors in a relatively short period of time (1295 kilometers of driving = approx. 14 driving hours). It also shows that in some of the injectors, the Catalyst improved the fuel flow slightly above the pretest measurements. This was believed to be caused by a small level of carbon build-up during the pretest usage of the vehicle. Photos No. 1 and 2, show the spray pattern of injector No. 1 at the end of the hot soak cycle, and the same injector after the ACES IV catalyst treated cycle. 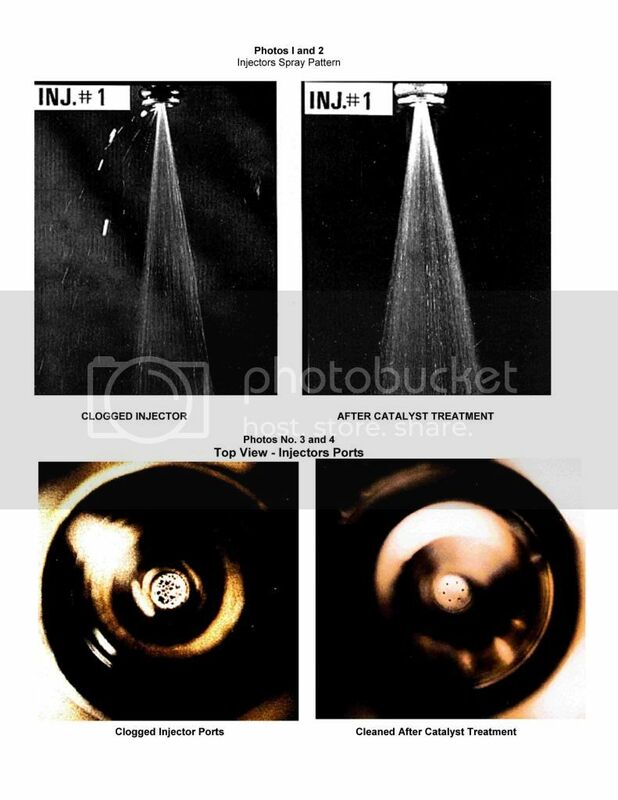 As illustrated here, the spray pattern of the catalyzed injector is much better than the clogged injector (mist versus spits”), and similarly, the spray angle of the catalyzed injector is much wider than the clogged injector (approx. 17° vs. approx. 21°). (40%). See Figure No. 10. To measure the ACES IV catalyst’s effect on cleaning and sustaining a clean carburetor, and the effect on intake system deposits, the product was tested by Southwest Research Institute (SwRl”). The test results showed that the gasoline treated with the catalyst (after 15 hours of runtime), reduced the build-up in the ISD bars by an average of 87.17% and reduced the deposit in the carburetor’s sleeves by an average of 31 .38%. See Figures Numbers 7 and 8, and Photos No. 5 and 6. 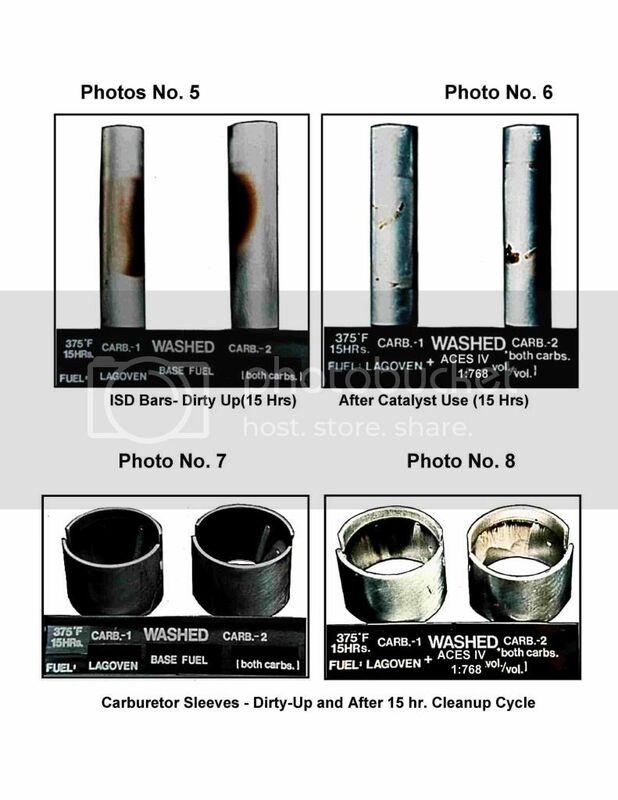 In addition to the catalyst’s effects of providing top cylinder lubrication, elimination of friction in valves and valve stems as was evidenced in the power test (in subsection 1 above), a separate test was conducted for evaluating the catalyst’s effects on reducing and/or eliminating valve seat recession. This test was designed to determine the catalyst’s potential effect as a lead substitute. The test was designed so that two engines would be tested side by side. Both engines, in identical conditions, were equipped with soft valve seats, the same seats installled in engines designed to run on leaded gasoline. One engine ran on unleaded gasoline ( 87 octane R+M/2 = 91 RON), and the second engine ran on the same unleaded gasoline with the addition of the ACES IV catalyst. The purpose of the test was to measure the valve seat recession in each engine, especially the treated engines, and to evaluate ACES IV catalyst’s capability to reduce or eliminate recession and to calculate its top cylinder lubricating quality. (1) the level of damage to the top cylinder area that would be expected when engines designed to run on leaded fuels (i.e., with soft valve seats) - operates on unleaded gasoline; and, (2), the potential of reducing or eliminating valve seat recession by treating unleaded gasoline with non-leaded additives designed to provide top cylinder lubrication. As mentioned earlier (in the section dealing with the EPA’s lead phase down program), the EPA determined that lead substitute additives can provide sufficient protection to the equipment being considered. In this test, each engine ran for 225 hours at various rpm’s (from 2500 - 4000). The engines ran with a lean mixture intentionally to keep the valves as dry and as hot as possible. This, substantially accelerated the wear factor to the point where 225 test hours were equivalent to approximately 50,000 miles (or more) of more intensive driving conditions. 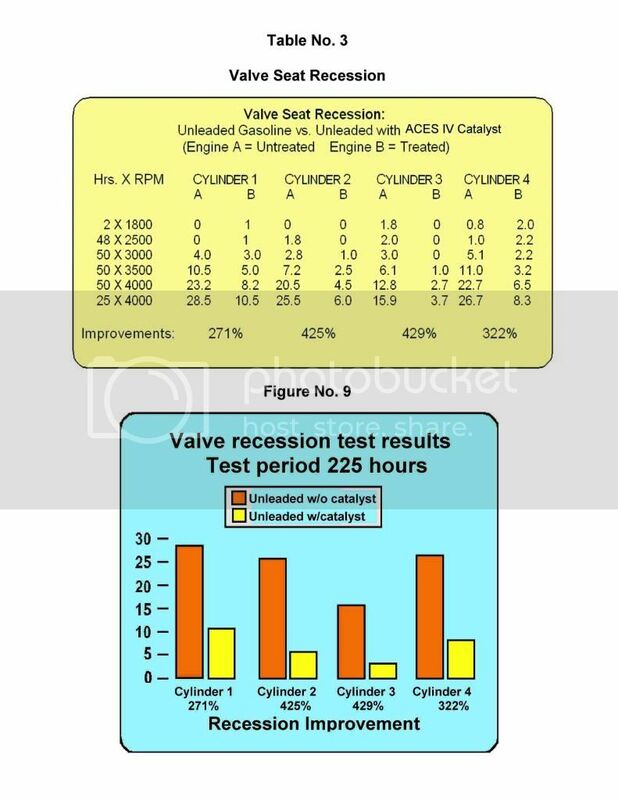 Table 3 and Figure 9 provide the detailed valve seat recession results of both engines -treated and untreated. As shown here, the ACES IV catalyst demonstrated superior ability to reduce valve seat recession. If one deducts the average expected valve bedding, the recession in the ACES IV catalyst engine is minimal (equal or lower than common new valve bedding/recession). In countries concerned about lead emissions and health problems, but at the same time, are concerned about potential engine damage to consumers with engines designed to run on leaded gasoline, ACES IV multipurpose Catalyst would be a solution. As determined by the U.S. EPA, non-leaded additives are capable of reducing and/or eliminating valve seat recession. It should be noted that the first 100 hours of the test, the engines ran at 2500-3000 RPM. The level of recession up to that point, can be considered bedding”. From the 101st hour on, especially as the engine’s load was increased, the level of valve recession increased rapidly. This supports the EPA’s final conclusion that when engines equipped with soft valve seats run on unleaded fuel, with moderate load and speed, no significant valve damage is expected. (1)	In dirty fuel systems, especially in injection systems, the fuel will not mist” as it should; the angle of the spray will not be as wide, and in many situations (if very dirty), the fuel will drip” and work its way to the crankcase before it has the opportunity to turn into vapor form. This will dilute the crankcase oil as well. Therefore, keeping the fuel system clean will contribute considerably to keeping emission levels low (closer to vehicle manufacturer certification). (2)	Deposits on intake exhaust valves and seats will result in a misaligned contact between the valves and the seats. This will cause compression loss, will adversely affect combustion, and can result in a reduction in fuel efficiency, power loss, and increased emissions (from a higher level of unburned fuel). (3)	Ignition improving additives, and/or fuels containing components that burn more efficient, will result in providing more power, improve fuel efficiency and will produce lower emissions as higher percentages of the fuel is burned. (4)	Accumulation of deposits in the combustion chamber area, especially on the tops of pistons and rings, will also reduce combustion efficiency. Keeping the combustion chamber area clean, will, therefore improve efficiency, power, and help keep emission levels low. 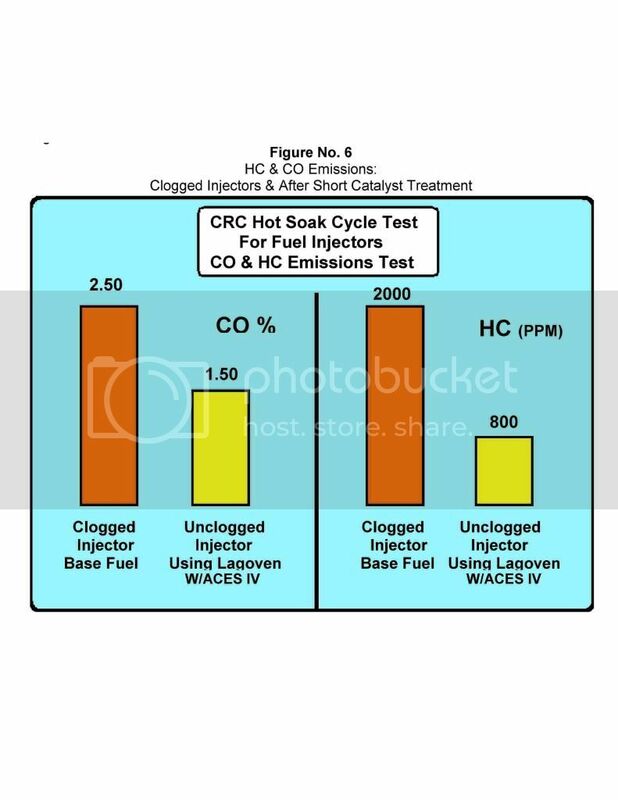 This was evidenced in the CRC Hot Soak Cycle (fuel injectors) test above (section 3). 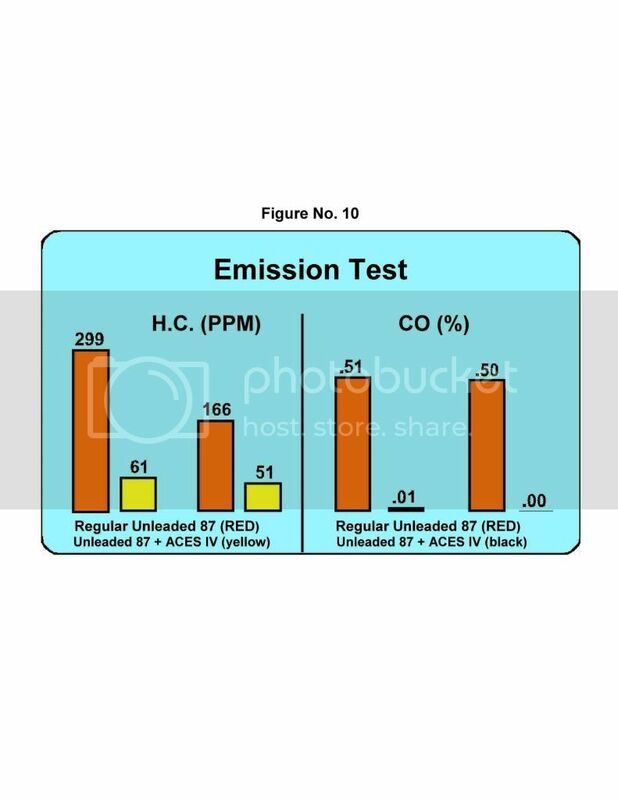 As shown in Figure 6 above, when the injectors were clogged, the HC count was 2,000 ppm and the HC was 2.5%. 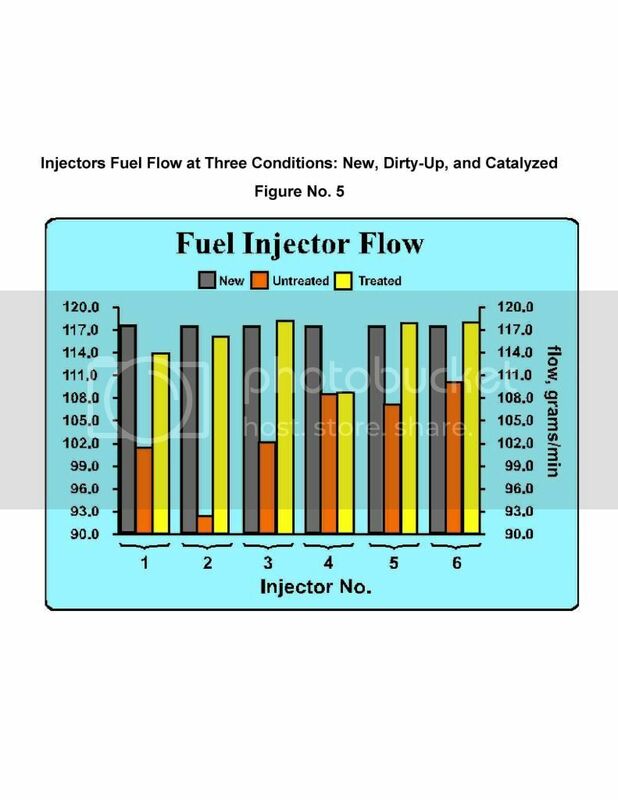 When the same injectors were treated with the ACES IV catalyst and the fuel flow and the spray patterns were improved, the emission levels were reduced. The HC dropped from 2000 to 800, and likewise the HC dropped from 2.5 to 1.5%. This also effected the engine’s idle and acceleration response, 5% power gain, and fuel efficiency. In addition to the CRC test, the ACES IV catalyst was tested for its emission reduction effect on a Chevrolet Blazer with a 2.2 liter engine (140 CID). Emissions were measured at low speeds (800 - 1100 RPM) and at higher speeds (2000 - 2200 RPM). The first test was performed on regular unleaded gasoline (87 octane R+M/2), and the second test by adding the ACES IV Catalyst. Table No. 3 and Figure No. 10 illustrate the results. 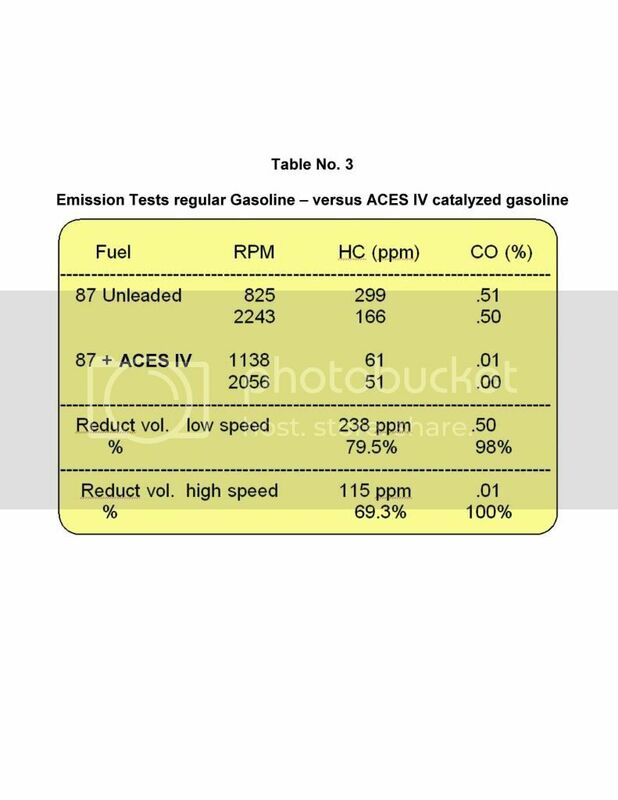 Road testing was done on engines designed to operate on premium gasoline (91-92 octane - R+M/2) with and without the catalyst, as well as testing with 87 octane (R+M/2) with the ACES IV Catalyst. These field tests, as well as numerous in-house chassis dynamometer tests, indicated that when these performance engines ran on 87 octane gasolines, detonation occurred, especially during fast acceleration and in heavy loads (uphill, etc.). However, when the same 87 octane was treated with the catalyst, detonation wasn’t noticed. For that reason, the following controlled engine-dynamometer test was performed. In this test, a modified 350 small-block Chevy engine was used. Pistons were used with D-shaped dishes in conjunction with # 186 close chamber-style head castings. A stock Quadra-jet four-barrel intake manifold was used with an adapter plate to adapt a remotely adjustable electronic four-barrel 650 CFM Holley carburetor. Performance-style exhaust headers were used, having a 1-5/8” primary and a 3-1/2” secondary collector.Thermocouples monitored temperature in exhaust ports. The engine was tuned to a point that it would be free of detonation when 92 octane (R+M/2) gasoline was used (which detonated with 87 octane gasoline). The engine was tested at various RPM’s, ranging from 2500 RPM to 5000 RPM, and increased at intervals of 250 RPM. The results confirmed the previous road and chassis dynamometer tests. The 87 octane gasoline treated with the ACES IV catalyst did not detonate, and produced an equivalent and somewhat higher horsepower than delivered by the 92 octane gasoline. See Table No. 4, and Figure No. 11. In addition to the performance features of the multifunctional ACES IV Catalyst, it also contains several other components which improve the fuel quality, resulting in reduced maintenance and extended engine life. This includes corrosion and rust inhibitors, metal-deactivators and anti-icing compounds. In all engines tested (including several race engines), in addition to fuel system and combustion chamber cleanliness and lubrication, other engine components were inspected and shown to receive substantial detergency benefits and friction reduction. This includes spark-plugs, valve stems, seals, cylinder walls, rings, and the fuel filter, etc. Other secondary benefits observed are the ease of cold starts, improved acceleration response, increased time between regular maintenance (tune-ups, fuel filters, injector life etc), and an overall increase in engine life (T.B.O.). This was also documented by experiments conducted by the Military Dept. (National Reserve) where a small fleet of pick-up trucks and vans were tested for a period of about 2 years. Eleven were treated with the ACES IV Catalyst and 22 were not. At the end of the test period, the vehicles treated with the ACES IV Catalyst accumulated 150,000 -200,000 miles without major repairs, whereas the fleet that ran without the catalyst (using the same base fuel) needed major engine repairs at 100,000- 120,000 miles. Some vehicles using the ACES IV Catalyst ran on the same spark-plugs in excess of 72,000 miles (pre platinum tip or copper annode). Last edited by 370 HEMI; 12-16-2014 at 08:04 AM. I did not see any where in this info that said anything about lubrication for the fuel pumps sense the gas is now at it's lowest sulfur content ever. Actually the Sulfur comment is a good one. Our gasolines have less than 30 ppm of Sulfur where it once had at least 130 ppm. Pumps need about 90 ppm equivalent and injectors at least 75 ppm. Also, there is this belief that sulfur imparts lubricity in the fuel, but it is rather the oxygen and especially the Nitrogen content that actually produces the lubricity in the fuel system components. Proper nitrogen bearing compounds in the fuel with ACES IV produces this important characteristic. Another characteristic of ACES IV is that it contains a 3 stage lubricity catalyst that responds to different conditions. Everyone knows that when a pump is pumping a liquid it creates friction and results in the pump getting HOT. The ACES IV will respond to the pump heat and start producing lubricity at this lowest temperature. So while it is going through the pump, it cleans the pump, and the temperature lubricates it upon heat reaction. When it gets to the fuel system it starts producing lubricity in the injectors as they also get significantly hot. This has a cleaning and lubricating effect also. When it finally gets to the intake manifold, the lubricity factors from the injectors help lubricate the intake valve and help seal it. Now when the ACES IV gets burned, it produces the most lubricant as a heat reaction creating the lubricant in the cylinder bores as has been substantiated in the testing that has been posted previously. This is how a certain NASCAR driver got caught with the ACES IV in his race car. Sunoco makes the "blue" for the NASCAR circuit and when you add ACES IV (which is red) you get purple. This "lubricant" or greasy substance is what was the tell tail sign was in the intake that something was different was added. A simple can demonstration will show what I am talking about here. Last edited by 370 HEMI; 04-07-2011 at 05:08 AM. Those who have spoken with you know this, your knowledge is endless. Always learn something new everytime. The plus is that your also a great person and easily become a good friend. I need a hug now. Lmao! Your welcome! The more we can show people what our materials do, the more people will make the move to protect their investments like you have with our products.